From the very beginning the proceeds from Poultry Days has been invested back into the community to support community projects and school activities including the donations to the Versailles Pool, Life Squad, Worch Library and School Development Association. A wide range of school activities have been supported from sports equipment to band uniforms. The festival began work on its own project and on July 4th 1985 the Festival dedicated Heritage Park. Originally intended to be a new location for the festival the project evolved into a 40-acre park including ponds, walking track, shelter houses and sports fields. The park is also home to several thousand Ultimate players each summer. While Poultry Days continues to fund the park, the independent Heritage Park Board oversees and maintains the park. The park has several shelter houses that are available for private parties, cookouts and special events. Anyone wanting to reserve a shelter house, would like to make a comment regarding the park, or make a donation, please contact Heritage Park Board Chairman Mike Poling via email at Heritageparkversailles@gmail.com, via Facebook, or at 937-423-2638. Our mailing address is P.O. Box 108, Versailles, OH 45380-0108. We hope you enjoy the park and are frequent visitors. 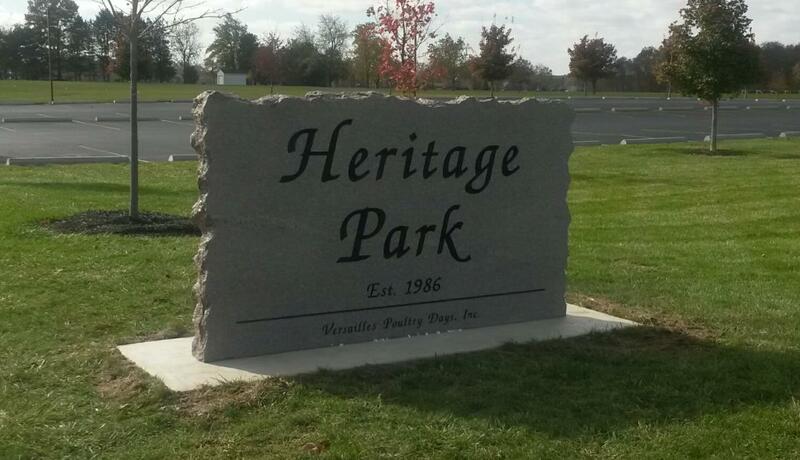 Heritage Park is located at 10200 Klipstine Road, Versailles, Ohio and open from mid-April to mid-October each year. The park is supported by donations including an annual donation from Poultry Days. Please respect the park to help us keep our overhead costs down and stretch our donation dollars to maintain the park in the excellent condition that you are accustomed. While we want everyone to enjoy the park, we also ask that you respect the safety of all patrons when engaging in any activities in the park.